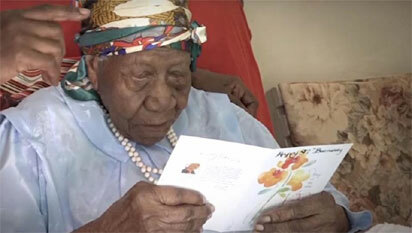 The world’s oldest person Violet Brown has died in Jamaica at the age of 117 years and 189 days old. The woman known as “Aunt V” died Friday at a local hospital, where she had been treated for heart arrhythmia and dehydration. With her death, the Gerontology Research Group lists Nabi Tajima of Japan was the oldest surviving person. She was born on Aug. 4, 1900. Brown spent much of her life cutting sugar cane. She remained active in her church until recently and credited her longevity to hard work and her Christian faith. She had four sons and two daughters. Her eldest son died in April at age 97.